As a kid, I remember making construction paper ring chains to count down the days until Christmas. It was such an exciting time of year. My sisters and I would skulk around the Christmas tree and shake the gifts with our names on them. My mom made amazing sweets, and in great quantity. I remember the decorations and how warm the house felt. We opened our gifts on Christmas Eve evening and got our stockings Christmas morning. My grandmother was usually staying with us for most of the time between Thanksgiving and Christmas and on Christmas we usually went to one of my aunts’ houses or a few would come to ours for a day of feasting, games, and more presents. I was by far the youngest in the house, so was not always included in game playing, but I still enjoyed just being there in the chaos. The day after Christmas seemed so quiet and subdued after all the excitement that had lead up to and culminated on Christmas day. I had all my new stuff to play with (and if I was lucky enough to have been gifted a book I could read for hours), but somehow there was a sadness that the experience was over. As I’ve gotten older, my Christmases have gotten smaller and we don’t generally have many gifts under our tree, but the warmth, the decorations, and the love are still precious to me. And sometimes the day after Christmas still seems sad. Now that looks a little different to me, because I have realized the warm feeling at Christmastime wasn’t as much of a physical warmth as the feeling of love. People are generally kinder to one another, including strangers, during the holiday season. Somehow it is easier to put aside differences and see each other as fellow human beings. Charitable donations and acts of kindness are on the rise. The idea of “peace on earth” seems almost possible. And then Christmas is over. Slowly, the kindness and warm feelings fade and we all go back to our normal lives and our routines, and many forget until somewhere around the end of the next November. The thing is, Jesus was the greatest gift ever given, and a gift that is everlasting. Those feelings of love and joy are intended to be kept all year. We are commanded to love one another, and I doubt that was meant to be a part-time job. Love takes work sometimes, and we get frustrated and tired, and life happens, distracting us. But let’s try to show love and kindness, even if only in some small way, each day. Be on the lookout for those opportunities. When we bless others, we in turn are also blessed, and then it is easier to keep it going all year long. Posted in Christian, Inspirational, nostalgia, Reflection, Uncategorized and tagged After Christmas, keep joy, kindness, love, love one another. Bookmark the permalink. I was coloring with my favorite little girl one afternoon when she suddenly started asking me the origin stories of some of the better known superheroes. Personally, I love Batman and told her about Bruce Wayne’s tragic loss of his parents and his way cool butler. She really wanted to know about Wonder Woman. I only knew a little, but we happened to be going to a friend’s for dinner that night who is a big Wonder Woman fan, so I told her to ask that evening. That night, she learned about Wonder Woman and watched the pilot episode of the Linda Carter show from the 70’s. By the end of the night she was wearing a replica tiara, bullet proof bracelets, and holding a golden lasso while spinning. And she hasn’t stopped since. My little girl IS Wonder Woman, and I’ve become a big fan too. A beautiful, smart, strong, courageous princess who fights for truth, justice, and love. What’s not to love? Or encourage? I could not ask for a better role model in a world saturated with everything I never want my princess to become. She is a little girl who always favors the female characters, but in her eyes, even Leia couldn’t compete with her curious love of Darth Vader (though Leia has always been a hero to me), and she was still looking for the perfect hero. But of course, she doesn’t just want to be strong; she wants to be pretty…and a princess. Naturally, she also still loves the Disney Princesses. We very recently watched the 2015 live-action version of Cinderella, who happens to be one of her beloved princesses. Now, I know there are arguments out there that these old fairy tale princesses teach young women to be weak and to depend on being saved by their “prince charming,” but I think that just shows a lack of responsibility in teaching our young girls the values and virtues of each of those princesses. Is Cinderella weak because she has to be whisked away to the castle by her prince? I don’t think so. She was good, kind, and beautiful, and was in the end rewarded for it. Princess Diana lived in a land without men, and beyond learning to be strong and to defend herself and what is right physically, her virtues are the same as many of those fairy tale princesses. Many of those values of her femininity are what makes her such an amazing character. Our little one is not quite old enough that we feel she should see the new Wonder Woman movie yet, but she will one day, and I wonder if she will get goosebumps and tear-filled eyes when Diana climbs up a ladder and rushes through No Man’s Land the way I did. Will she also get goosebumps and tear-filled eyes when Belle (Emma Watson) dances with the Beast in the grand ballroom brought to life…the way I did? I really hope she does. Heroes don’t have to only be physically strong. A real hero is also emotionally strong, unafraid to show a tender side, and does right, even when it is hard. Mostly, heroes need to stand for something and reflect something we want in ourselves. Posted in Inspirational, Reflection, Uncategorized and tagged hero, justice, love, princesses, truth, values, virtues, Wonder Woman. Bookmark the permalink. My house is quiet this morning. The dogs followed me out of the bedroom but collapsed while I made my coffee. My husband softly snores yet with the cat. There are no excited children to open gifts. It is just me and thoughts. Whether today is the true date of Jesus’ birth or not, I am thankful that he agreed to come here and be born as a little baby who would suffer the trials of mankind, growing in communion and fellowship with so many imperfect people. These were the people who were looking for him, yet refused to see him. Even as a baby he was born to die. He was a sacrifice. Imagine growing up knowing that. Then imagine him surrounded by the hatred and cruelty of mankind (not so different than it is today), and deciding to die for us anyway, Jew and gentile alike. In fact, he died for anyone and everyone who would choose him. This Christmas, I am thankful for the greatest gift ever, God’s son. So many are lost, hurting, and confused. If I read the news, it brings me to tears more often than not. How can we believe in good when we are surrounded by so much evil? But I pray for this to be a day that gives hope. I pray everyone would have a small moment in their busy days to look past the commercialism and truly appreciate what Christmas represents. There is hope, if we only look. I pray we may all focus on the good and what we do have. I pray for hurting people to find peace. And I pray my little girl would always continue to love God and believe with her childlike faith. Posted in Christian, Inspirational, Reflection, Uncategorized and tagged Christmas, greatest gift, hope, Jesus if the light, love, peace. Bookmark the permalink. Love cannot be forced, but it is a force. It makes you do what is best for someone and makes them happiest, even if it hurts you or your pride, because love has no pride; true love is selfless. Love makes you listen, even when you do not understand, so that you can understand. True love makes you put yourself aside, knowing you would put your life aside for the one you love if needed. True love feels the pain of the one you love, just as if it were your own. And no pain more unbearable than having to lose each other. Posted in Reflection, Uncategorized and tagged love, selfless, true love. Bookmark the permalink. The most telling test of a true friend is what they do when your life hits its lowest point, like mine did this year. I was hit with one thing after another, each compounded by complications of those circumstances. That’s vague, but that’s all you need. If you’ve been through a time when all you waned to do was stay in bed and hide from life, but you knew you couldn’t, so you robotically went through the motions, then you know what I mean. Basically, the only way I could have felt worse would have been by the death of a loved one, which thankfully never happened. In this time, I desperately needed friends. The thing is, people are busy with their lives, and the formalities of one text to check in on me one time may have come, but only a few continued to check on me, knowing my introvert self was unlikely to reach out on my own, but that I still needed to know people cared. I am so grateful to those people, even if all they did was repeatedly send me texts to check on me, and for the ones who got me out of the house and just let me talk it out. I was surprised when certain people I had always thought would be the first at my side seemed to shrug their shoulders at my pain, seeming never to give it a second thought, while others who I really didn’t know all that well yet reached out and helped me through. I didn’t even realize that I’ve been dealing with anger and rejection until recently. What happened to the friendships I had valued so much before? They disappeared in my darkest time and sometimes even seeing these people in passing actually made me feel sick and angry, smiling and hugging, and going about their business, or should I say busyness. I hope when my friends need me that I am not too blind and busy to see. I would hate to ever make anyone feel that pain. Then I heard the song “Seasons of Love” from the play Rent, and I started thinking about how our lives go through seasons, and our friendships fall into that as well. Admittedly, I do not easily open up and truly connect with people, so when I do, I obviously hope such a friendship will last forever, but life doesn’t work that way most of the time. Some of our friendships are just for a season, and when that season passes, new people enter our lives. Even in my hurting, God knew what I needed, and He brought me comfort and love, even if it wasn’t where I would have thought to look. But that’s why He’s God and I’m not. Posted in Christian, Reflection and tagged freindship, Friends, hurt, love, seasons of friendship. Bookmark the permalink. It has been months now since I took the time to write a heartfelt post. Partly, I have been overwhelmed with life, and partly, the last time I did so, someone took what I wrote out of context and tried to use it against me. It’s hard to bare your soul when people are looking to turn it on you as an emotional weapon, but this person only did so because of her own emotional instability. Today, Mother’s Day, pulled stirrings in my heart to the surface, and it felt like the right day to make a comeback. I have always celebrated my own caring, giving, and loving mother on this special day, and my husband sometimes joked about how I am a mommy to our fur children. However, this year, Mother’s Day has taken on a whole new meaning for me. On this day last year, I was traveling home from an out of town job, not having much reason why I would need to be at home. I arrived home, called my mother, and probably spent the remainder of the day watching movies with my husband and our dogs. What would happen just two months later was nowhere on my radar. One day in June, after going out to watch one of the final USA games in the World Cup, my husband and I arrived at home, and because we could, we took a mid-afternoon nap. When I awoke, my mother had called and wanted me to call her back. It was urgent. Groggy, I dialed her. The long story short version is that my husband and I were called upon to take on a huge responsibility that would most certainly change our lives completely. After fourteen years of blissfully childless marriage, we had been asked to take in a four-year old girl. How do you even consider saying no to that? When I hung up the phone and approached my husband, his reaction was much the same as mine: shocked, but not doubting we needed to do the right thing. Our preparation for parenthood was nine days, whereas most parents get nine months. Wow! You can scan back through some of my previous posts to learn more about the adventure as it unfolded, but today the reflection is on the meaning of motherhood. I was confused for some time as to what my role was to be in this little girl’s life. After all, she technically still has a mother. I’m just the aunt she is living with, right? But motherhood is so much more than giving life to a little one; it is sustaining that life and growing it with the nourishment of love. As it turns out, a mommy is the one who tucks you in and prays with you at night and gives you much needed hugs and kisses every day. A mommy is the one you cry for when you skin your knee (I have Star Wars Band-aids). A mommy is the one who helps you discover who you are and teaches you life lessons every time an opportunity presents itself. A mommy tosses and turns at night, hoping she is doing a good job, and prays God will give her the wisdom to always do what is right for her little one. She caresses you when you’ve had a bad dream and listens helplessly all night to your coughs when you are sick, wanting to take them away. A mommy is there for you; she doesn’t leave. These are the qualities of a mommy, and so, I have finally discovered, that I am now a mommy. It is the hardest, yet most rewarding role I’ve ever taken in life. Happy Mother’s Day to all the wonderful mommies out there. Love them unconditionally. Love them forever. Don’t let them go. Posted in Inspirational, Reflection and tagged devotion, first Mother's Day, love, Mommy, Mother, Mother's Day. Bookmark the permalink. My husband and I have wanted to be missionaries or some sort of heroes in the battle against human trafficking. Wanting to stand in the gap for others makes us good people, right? I guess I was feeling like I was a pretty good person. I left my teaching job in order to begin reflection and finding our place in this (also because I felt God urging me to leave it since the job consumed me). I spent a year recovering from my career, writing, and wanting to get in touch with what God’s plan was for me. However, I found myself lacking in the spiritual revelation area. Parenting in any form had never crossed my mind. That would get in the way of what we really felt we should be doing in helping others. We were so much the unparents that people joked about how unparent we were. Then, through a series of events still unbelievable to me, we ended up agreeing to take in a four-year old girl, related to me. We knew it was the right thing and were beginning to see how God had made a way for us to be in place for this child when she needed us, but it was hard, and we were only beginning to see it, after all. At first, I felt like this might get in the way of us doing the big plan we knew God had for us. I also was selfish because I didn’t know how I was going to have time to be me anymore. This was a legit worry for a couple who never planned to have kids in over 14 years of marriage. And it was a legit shock to my world since I had just experienced a year of total freedom to do what I wanted, when I wanted. But, still, I was being selfish. I had to grow up and look beyond myself. 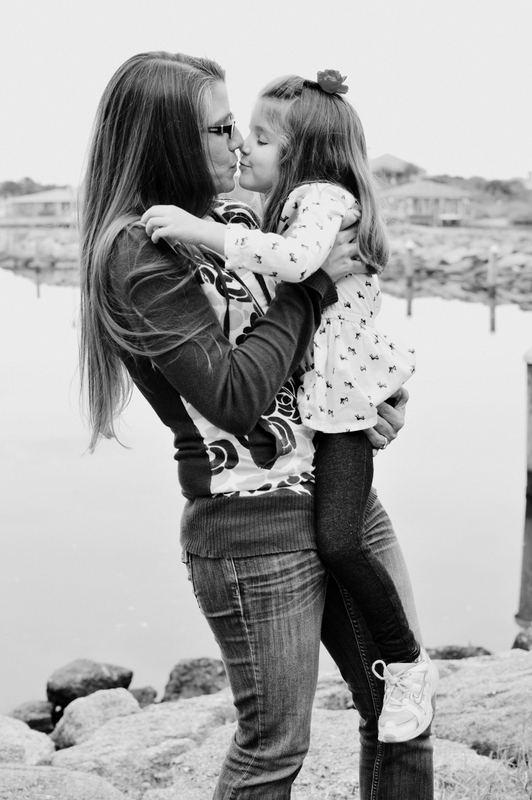 We were doing the best we knew how to raise a displaced little girl, but my inexperience had me wondering why God would have her with me, of all people. There had to be someone better equipped. People seemed to think my husband was made for the role, but all the jokes from the past of me being such an unparent were messing with my confidence and making me feel overwhelmed and sorry for her having been placed in my care. Surely God had made a mistake. Oops! One day, I picked her up from school and had to take her for a school physical. Maybe she hadn’t slept well the night before, because she was moody…or maybe she was just picking up on my insecurity. She threw a fit I didn’t understand and I didn’t know what to do. When we arrived at our destination, I could no longer hold back my tears. I apologized to her for having to live with me because I wasn’t sure what I was doing and she deserved better than me. She looked at me with big, loving eyes and began to cry too. She hugged me so tightly. In that second, I realized this little girl had been traumatized by rejection, and I had to pull it together for her and give her the sense of security all children need, because she was acting up only because she was scared and living with hurt from the situation that had brought her to me in the first place. We couldn’t both be scared. I was the adult. I had to reassure her and be strong and loving. I let her know then that I was going to do my best to be better. It’s still not always easy, and many sacrifices have been made by my husband and I, but she has been every bit as much a blessing to us as I hope we have been for her. We’ve learned routine and shared in love and learning…and I feel God has been using her to help me grow up just as He is using us to be her protection and love. When you love someone, selfishness has a way of going away, and without resent. It has to, or someone will suffer. I refuse to see her suffer any more. I never would have planned this for my life, but it wasn’t my plan. It was God’s. He has allowed us to be the security, love, and safety she was afraid she no longer had, and He has helped us to be more like Him, which is what the Bible tells us to do. Are we there yet? Of course not. We are constantly learning, but this blessing wrapped in a child has truly opened our eyes. We’ll never be perfect, but we are constantly learning more about how to love like God loves and to put others before ourselves. He has equipped us in love, finances, and support from so many people around us. It’s a continual adventure, but we’ve learned to trust God in all of it. When I heard the following song one day and truly listened to the words, I knew God was using it in that moment to speak to me. Maybe it can speak to someone else right now too. Posted in Christian, Inspirational, Reflection, Uncategorized and tagged God's love, love, love of a child, sacrificial love, unconditional love. Bookmark the permalink.